31 Massachusetts is located on the west side of Massachusetts Avenue, between Beacon and Marlborough, with 27½-29 Massachusetts to the north, across Alley 908, and 421-423 Marlborough (33-35 Massachusetts) to the south. 31 Massachusetts Avenue was designed by architect Samuel D. Kelley and built in 1891 by David L. Rand, mason, as a twelve unit apartment, The Stratford, for Edwin B. Horn, Jr., a jeweler and real estate developer who lived at 11 Greenwich Park. He is shown as the owner on the original building permit application, dated April 21, 1891. The original address of the building was 460 West Chester Park; it became 31 Massachusetts Avenue when West Chester Park was renamed Massachusetts Avenue on March 1, 1894. Edwin Horn purchased the land for 31 Massachusetts Avenue on March 7, 1891, from Henry Lee, H. Hollis Hunnewell, and Augustus Lowell. The land was part of a larger parcel that Henry Lee and his partners purchased on February 20, 1883, from a real estate investment trust formed by Grenville T. W. Braman, Henry D. Hyde, and Frank W. Andrews. The parcel was one several tracts of land the trust had purchased from the Boston Water Power Company on March 1, 1872. Click here for an index to the deeds for 31 Massachusetts Avenue, and click here for further information on the land west of Massachusetts Avenue between the south side of Beacon and the north side of Commonwealth. In October of 1889, Edwin Horn had purchased the lot to the south, with a frontage of 79 feet on Massachusetts Avenue, from Henry Lee and his partners, and had built apartment houses at 421 and 423 Marlborough. 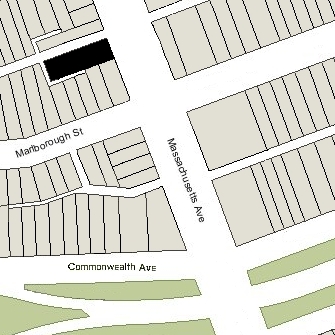 In subdividing their land, Henry Lee and his partners had created two passageways to provide access and drainage to the alley: a four foot wide passageway behind 427-429 Marlborough connecting with a six foot wide passageway behind 31 Massachusetts Avenue extending north to the alley. Unlike similar passageways elsewhere in the Back Bay (for example, at the rear of houses facing on the side streets), these passageways were not created as easements over the lots, but as separate open spaces “appurtenant to the granted premises” to which each property owner had access in common with the owners of the other the abutting properties. By the 1891-1892 winter season, the first residents had taken up occupancy and the building was known as “The Stratford” (“The Cambridge” was used several years later as the name of the much larger apartment house at 483 Beacon). On May 12, 1892, 31 Massachusetts Avenue was purchased from Edwin Horn by wall paper merchant Charles Henry Hayden. He was unmarried and lived at 12 East Brookline. During the 1893-1894 he lived at 299 Beacon, and then moved to 144 Marlborough, where he continued to live until his death in August of 1901. On December 21, 1904, 31 Massachusetts Avenue was acquired from Charles Hayden’s estate by metals dealer Edward E. Drew, and on the same day he conveyed the property to Miss Anna (Annie) Louise Richards. She lived at 394 Beacon with her mother, Ann R. (Babcock) Richards, the widow of Calvin A. Richards. He had been a wine and tea merchant and a real estate investor, and had also served as president of the Metropolitan Street Railway Company. On January 4, 1909, the top floor of 31 Massachusetts Avenue was damaged by a fire. The building’s janitor, Thomas Baker, was praised in a January 5, 1909. Boston Globe article for his swift action in notifying the fire department and contacting the residents to avoid panic. 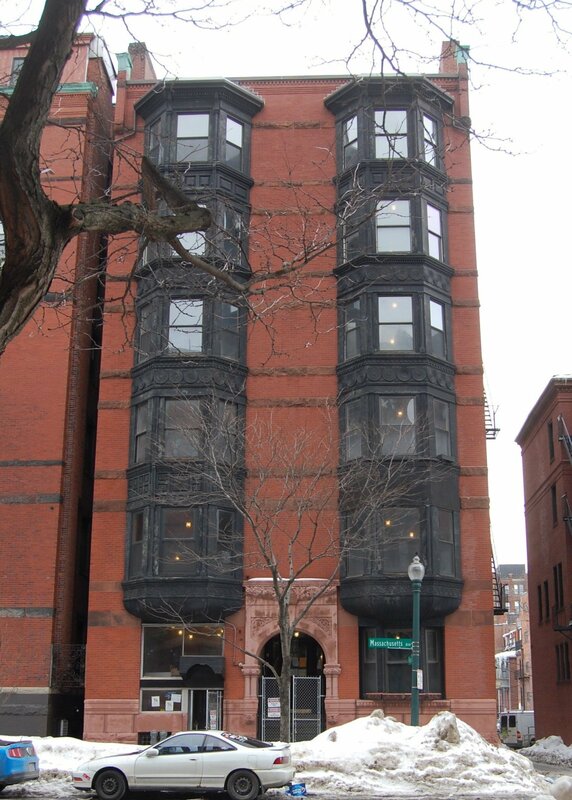 On June 28, 1919, 31 Massachusetts Avenue was acquired from Annie Richards by John D. MacLeod. The property changed hands and on January 12, 1928, was acquired by real estate dealer Ray C. Johnson. On May 15, 1929, it was acquired from him by Mary E. McDonough. On March 1, 1931, Edward E. Rice foreclosed on a mortgage given by Mary McDonough and sold 31 Massachusetts Avenue to Hardcastle C. Alison. In August of 1931, Edward Rice (presumably on behalf of Hardcastle Alison) applied for (and subsequently received) permission to subdivide four apartments, increasing the occupancy from twelve to sixteen units, plus the janitor’s unit. The property changed hands and by the mid-1930s, was managed by Parker & Phillips, real estate and insurance brokers in Brookline. In October of 1935, Parker & Phillips filed for (and subsequently received) permission to subdivide one of the apartments on the sixth floor “with same layout as the floors below,” increasing the number of units from seventeen (including the janitor’s unit) to eighteen. June 12, 1936, 31 Massachusetts Avenue was acquired by Miss Lillian Y. Chandler and Miss Inez Ulricka Harrison. Lillian Chandler and her mother, Ella (Young) Chandler, the widow of Henry Gordon Chandler, lived in one of the apartments. Lillian Chandler operated a real estate rental service, possibly in conjunction with Parker & Phillips. Inez Harrison was a legal secretary and lived in Somerville. Ella Chandler died in 1940. Lillian Chandler continued to live at 31 Massachusetts Avenue until the late 1940s, when she married Dr. Thomas J. Kyle and moved to Rockport. 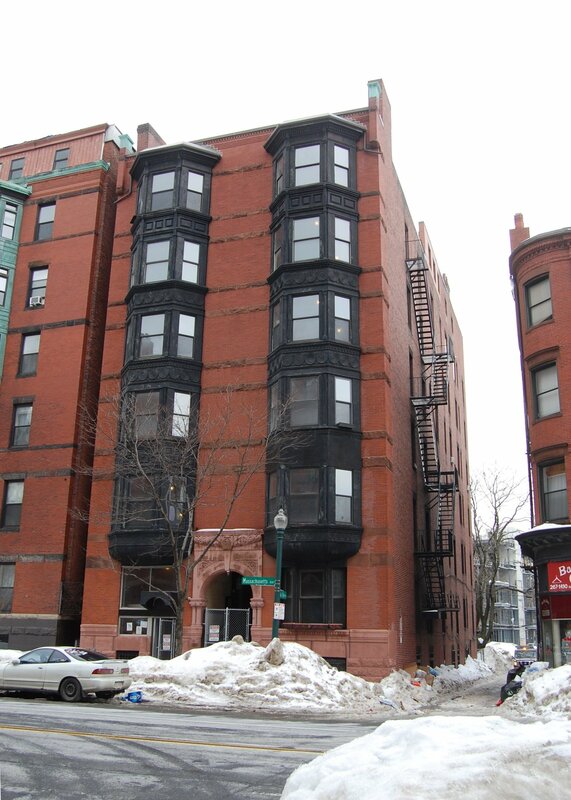 On January 16, 1950, 31 Massachusetts Avenue was acquired from Lillian Kyle and Inez Harrison by Philip S. Parker, Jr., of the Parker & Phillips real estate firm. The property changed hands and on March 30, 1951, was acquired by real estate dealer and manager Harry A. Hamacher. In September of 1952, he filed for (and subsequently received) permission to remodel the building and increase the number of units from 18 to 20. By the early 1950s, a penthouse had been added to the property and in December of 1952, Harry Hamacher filed for (and subsequently received) permission to “install new front stairway and stair hall to penthouse from sixth floor” and remodel several apartments, increasing the occupancy from 20 to 25 units. In March of 1953, he filed for (and subsequently received) permission to change the occupancy from 25 apartments to 25 apartments and an optical office on the first floor. On December 23, 1953, 31 Massachusetts Avenue was acquired from Harry Hamacher by M. Harry Golburgh, trustee of the Jon-Roy Trust. On September 30, 1958, 31 Massachusetts Avenue was acquired from M. Harry Golburgh by Dr. George J. Colantino and Charles G. Martignette, trustees of the Three Fifty Two Beacon Realty Trust. George Colantino, a physician, and his wife, Edith E. (Fitzgerald) Colantino, lived at 404 Beacon. Charles Martignette, a florist, and his wife, Marie C. (Della Femina) Martignette, lived in Somerville. In May of 1959, the trust filed for (and subsequently received) permission to increase the number of apartments from 25 to 31 by creating six apartments on the basement level. On November 30, 1960, 31 Massachusetts Avenue was acquired from George Colantino and Charles Martignette by Charles T. Bullock. He was an instructor at Tufts Dental School and lived in Hingham. On June 11, 1964, 31 Massachusetts Avenue was acquired from Charles Bullock by Barnett Nathan Samuels and his sons, Burton Samuels and Martin A Samuels, as trustees under a trust dated January 2, 1964. In October of 1964, they acquired 421-423 Marlborough. On October 9, 1980, 31 Massachusetts Avenue was purchased from the trust by Stratford, Inc., organized by Burton Samuels and Martin Samuels. On March 30, 1981, Stratford, Inc. converted the property into 30 condominium units, the Stratford Condominium.